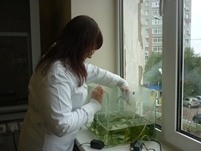 The Samara State Technical University research involves water phytoremediation with the use of Myriophyllum Verticillatum. Student research work is continuing under the Alcoa Foundation in Russia Responsible Water Resources Management for Sustainable Development Program (2011-2013) to study the process of water phytocleaning and to recover components from it with the help of the water plants myriophyllum verticillatum, which is also known as myriad-leaf. Myriad-leaf is an aquatic plant that grows in stagnant or low-flowing bodies of water in Central Russia, including the Samara Region. The program is coordinated in Russia by the NGO Fund for Sustainable Development, Moscow. Key partners include Institute of Water Problems at the Russian Academy of Sciences (Moscow) and the Education Center of Ecology and Safety (Samara). To date, very little is known about myriad-leaf as a sorbent of components that contaminate natural water bodies and the research looks at the plant in relation to various pollutants and biogenic elements. It is important that this is a widespread plant in Russia and after a series of studies it could potentially be used as a natural component for cleaning industrial sewage. A group of students from the Chemical Technology and Industrial Ecology Department at Samara State Technical University in Russia led by associate professor Alina Kopnina and post-graduate student Olga Zavodskaya conducted a number of experiments aimed at exploring the capability of myriad-leaf to extract various contaminants from sewage and contaminated water. The main objective of the research is identifying the possibility of using this plant for cleaning water from organic impurities, specifically petroleum derivatives. The students not only studied the possibilities of restoring environmental quality by extracting organic matter from wastewater, but the capability of plants to remove mineral components from water, such as ions of various toxicants and a number of unwanted biogenic elements. In the course of biological water cleaning from organic impurities one of the key stages is air oxygen aeration and, thus, during all of the tests medium bubbling aeration was performed. Aeration is a key phase as this is when oxidation of organic matter occurs. The researchers compared the effectiveness of applying pure aeration and aeration with plants by performing two tests with benzyl solution. The results show the practicability of conducting aeration for not less than two hours, because during this period of time a minimum decrease of the common content of organic matter (COD) in water is observed. On the average, COD is decreased from the base value of 222 to 47.5 in the case of pure aeration and up to 16.5 mgO2/l during cleaning with the use of myriad-leaf. Purification efficiency without plants with aeration is 84-94 percent, while with myriad-leaf it is 90-97 percent. Thus, phytocleaning efficiency is higher by 4-13 percent. However, the higher purification efficiency is reached during a combined use of myriad-leaf and aeration. Additionally, studies were carried out to recover ethanol from test solutions. Model solutions of pollutants with only one component were used and, thus, ethanol may be viewed as a primary pollutant. The optimal cleaning efficiency, or the difference between the initial and final concentration of polluting matter, was 52 percent however when using microorganisms associated with myriad-leaf alone for cleaning water from ethanol, the efficiency was only 17 percent. In the study of this component dynamic conditions were applied as well, during which the model solution flows directly through a mass of myriad leaf during a certain period of time. In these conditions and with additional aeration, efficiency was increased to 89 percent. An experiment was conducted to study the possibility of recovering iron ions (III) from water with the help of myriad-leaf using test solutions with different contaminants. The content of heavy-metal ions, including of iron III, is a problem for fresh water bodies in Russia. They penetrate water bodies with poorly treated industrial effluent, they build up in living organisms and are transferred through trophic chains and, thus, it is essential to remove them from water with less costs and using the self-restorable properties of water bodies. Studies found that the more myriad-leaf used, the higher the cleaning efficiency. The average iron recovery efficiency with the use of myriad-leaf is 70-75 percent, though after repeated use of myriad-leaf for recovering iron ions from water the sorption activity of the plant decreases. Microorganisms that inhabit the plant also absorb iron, but not as efficiently as the plant itself. Specifically, the most optimal ratio of the mass of the treated solution and the iron ion concentration is from 1 to 10 mg/dm3 with the mass of the plant being 2-5 g. To increase the efficiency of cleaning solutions with an iron concentration exceeding 6 mg/dm3, the ratio of the mass of the solution and the mass of the plant may be increased to 2-10 g.
Further studies of the water phytocleaning process were linked to recovering sulfate ions with the use of myriad-leaf. Test solutions were used based on aluminum sulfate. The concentration range for sulfate ions was from 100 to 800 mg/l. As a result of conducted experiments it was found that the largest degree is cleaning is achieved at a concentration of 600 mg/l of sulfate ions for myriad-leaf and 300 mg/l for the test solution. Microorganisms are only active during the first two hours. Sulfate ions are also components of poorly treated industrial effluent. The next component studied as a contaminant was chromium (VI). After the first series of experiments have been conducted it became clear that myriad-leaf is capable of cleaning sewage from six-valent chromium. The more time myriad-leaf was in contact with the contaminant solution, the higher was the cleaning efficiency. After 18 hours of contact between the plant and the contaminant solution, the cleaning efficiency begins to increase rapidly, reaching around 50 percent by 22 hours. After three days of observations, no noticeable growth in cleaning efficiency was recorded. Therefore, it takes approximately 72 hours for the cleaning efficiency to reach a maximum. As for the dependence of cleaning efficiency on the concentration of chromium ions, it was approximately the same at a concentration from 20 to 50 mg/l, reaching around 40-50 percent. Test solutions with concentrations over 50 mg/l kill the plant in 24 hours, with cleaning efficiency dropping to 30 percent, closer to 100 mg/l. The model solution, as myriad-leaf, shows relatively higher efficiency with low concentrate solutions among the whole range of studied chromium concentrations in water, but much less than the plant itself (by 20-30 percent ). The research also focused on the possibility of recovering phosphate ions from water using myriad-leaf. This is of interest because phosphates that penetrate the environment lead to rapid development of algae. The optimal time of contact of the plant and the phosphate solution was 6-6.5 hours, with cleaning efficiency reaching 56 percent. In this experiment, dynamic conditions were used, which are those in which the model solution is directly flown through a plant mass during a certain period of time, as well as static conditions, which is when a particular amount of the model solution is in the retort for a certain period of time. In this case cleaning efficiency was 17.5 percent. In a study of the activity of microorganisms located on the surface of myriad-leaf, cleaning efficiency was 14 percent. Thanks to support from the Alcoa foundation, nearly 10 articles on the results of studies have been published. Seminars are organized on an on-going basis, as well as lectures for students and professionals in the field of phytoremediation that have been attended by 200 students. Of note, these findings are the first in the study of myriad leaf as a sorbent of various components, and found that the plant may be used for treating sewage as a higher water plant at biological treatment facilities in industry by studying the properties of this plant and also utilizing the self-restorable properties of water bodies. Our research was used in student practical laboratory studies as a visual example of sewage phytocleaning processes.